In April, signs of spring are all around us — warmer days, daffodils poking their yellow petals through the soil, and in a few places, cherry blossoms. Winter sports lovers: there’s still snow in northern locales including Lake Tahoe, where you can end the season in style before stowing away your gear. Along with comfortable spring temperatures comes the urge to enjoy the outdoors, and what better place to satisfy that wish than state and national parks? 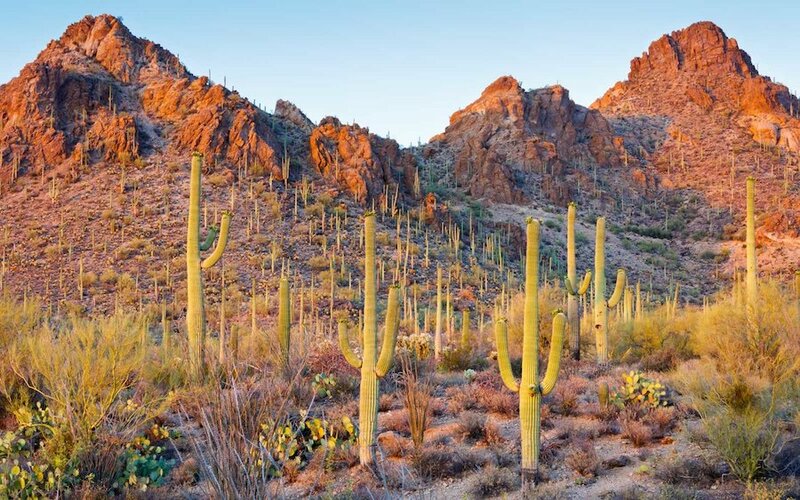 A trip to Tucson’s mountains and deserts would fit the bill, and St. George in Utah combines natural beauty with artistic creations at their annual Art Festival in April. In South Carolina, Palmetto Bluff offers mild temperatures and much to do on both land and water, with a golf course, shooting club, equestrian stables, as well as a river and wetlands for fishing and boating. If flowers are a sure indication of the season for you, cherry blossoms in Japan’s Aomori Prefecture will send their message loud and clear. Closer to home, Toronto’s Sakura cherry blossoms usually appear by late April. In Wilmington, North Carolina, spring brings azaleas, celebrated in their annual Azalea Festival from April 3-7 with concerts, parades, and other events to welcome the season. You can have your summer a bit early with a trip to Grand Cayman where warm, dry weather will provide the perfect backdrop for water sports or just lounging on the beach. On Florida’s Gulf Coast, Dunedin’s beaches, state parks, and jazz age heritage make this a unique spring destination. Get to California’s Newport Beach before summer crowds to enjoy the shore and last month of the gray whale migration. If there’s time for a longer trip, Western Australia’s early autumn brings beach weather and a quirky street arts festival in Fremantle, a short trip from Perth. April is an excellent time to visit Venice, and for fans of cruising, Crystal Cruises offers Mediterranean adventures with Venice shore excursions designed to meet everyone’s interests. Visiting a new destination or returning to a favorite one somehow both relaxes and energizes us. You might find that a springtime trip can be as refreshing as an April shower.